PARIS -- The European Union prepared a $15 billion aid package to Ukraine on Wednesday and froze the assets of 18 people blamed for looting the treasury of the nearly bankrupt country. The moves came as top diplomats from the West and Russia gathered in Paris to defuse tensions that have approached Cold War levels. CBS News correspondent Margaret Brennan reports from Paris that U.S. Secretary of State John Kerry is expected to tell Russian Foreign Minister Sergey Lavrov later Wednesday that there is a peaceful way out. In a possible diplomatic "off-ramp," the administration is asking Russia to send its troops back to the barracks, to accept international monitors and to recognize a May election to set up a new government in Ukraine, Brennan reports. Speaking in Madrid just hours before the meetings in Paris, Lavrov reiterated Moscow's stance that Ukraine's newly installed president, and the uprising which forced his predecessor, Kremlin-backed President Viktor Yanukovych, to flee Kiev, were "illegitimate." Lavrov said Russia could not order pro-Russian armed groups in Crimea to return to their bases because they are Ukrainian "self-defense" forces which do not answer to Moscow. "If you mean the self-defense units created by residents of Crimea, we give them no orders, they take no orders from us," he told the news conference shown live on Russian state television. 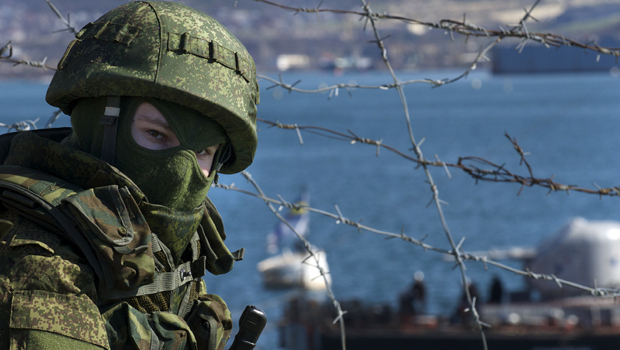 "As for the military personnel of the Black Sea Fleet, they are in their deployment sites," Lavrov said, referring to a Russian naval unit based in Crimea. "Yes, additional vigilance measures were taken to safeguard the sites. "We will do everything to prevent bloodshed, and obviously we will defend everybody in Ukraine, including citizens of the Russian federation." He also said it was up to Crimean and Ukrainian authorities to decide whether to grant international monitors access to the region. Former U.S. Defense Secretary Robert Gates told "CBS This Morning" co-host Charlie Rose on his PBS program Tuesday that Russian President Vladimir Putin was trying to re-establish Russian influence over the former states of the Soviet Union. "He doesn't want to bring them back into the Soviet Union," said Gates. "He doesn't want to recreate the Soviet Union. He just wants them, in effect, to be part of an alliance with Russia but where they essentially do Russia's bidding, and he's trying to prevent them from moving to the West." NATO was taking up the issue directly with Russia in an extraordinary meeting in Brussels of the military alliance, originally created as a counterbalance to the Soviet Union. The ultimate goal in Paris is to get the Russian and Ukrainian foreign ministers in the same room for the first time in the rapidly evolving dispute whose stakes have risen steadily since the departure of the pro-Russian president and Moscow's takeover of the strategic Crimean Peninsula. Neither side ruled out a meeting during a day of fast-moving diplomacy. "It will be a test this afternoon of whether Russia is prepared to sit down with Ukraine, and we will strongly recommend that they do so," British Foreign Secretary William Hague said. On the verge of economic collapse, Ukraine accused Russia of a military invasion after pro-Russian troops took over Crimea on Saturday, placing forces around its ferry, military bases and border posts. Moscow does not recognize the new Ukrainian leadership in Kiev that ousted the pro-Russian president, and raised the pressure by threatening to end discounts on natural gas supplies. Wednesday's offer by the European Union matched the Russian bailout for Yanukovych. Yanukovych took the Russian loans instead of a wide-ranging trade and economic agreement with the EU, which fueled the protests that eventually led to his ouster. On Tuesday, the U.S. readied a $1 billion aid package. "The situation in Ukraine is a test of our capability and resolve to stabilize our neighborhood and to provide new opportunities for many, not just a few," European Commission President Jose Manuel Barroso said. Wednesday's Paris gathering, originally scheduled to deal with the Syrian refugee crisis, came after Putin appeared to step back from the brink of war, but the crisis is far from resolved. "This is my first trip to such an important venue where the Ukrainian future, maybe the future of the region, will be decided," Andriy Deshchytsia, Ukraine's foreign minister, said of the meetings in Paris. "We want to keep neighborly relations with the Russian people. We want to settle this peacefully." On the flight from Kiev to Paris, Deshchytsia told reporters that Ukraine was unlikely to go to war to prevent Russia from annexing Crimea but said doing so wouldn't be necessary because Russia would be unwilling to suffer the resulting economic penalties and diplomatic isolation. "They will not be contented with assurances that these people are volunteers, who bought their uniforms in a shop," Polish Defense Minister Tomasz Siemoniak said. The hope is to learn "who is in power there and conclusions the OSCE should draw from that."